It’s been a while since my last post about Sepilok Orang Utan Sanctuary — Sabah, Malaysia, and I’ve got some other travel stuff coming up so I better finish this series off! 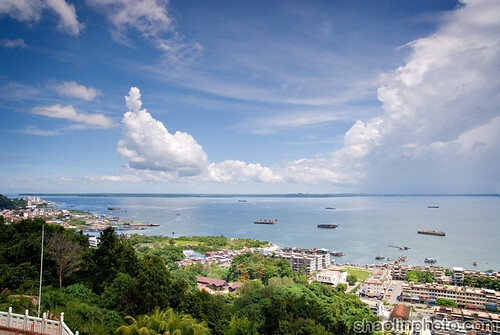 We headed off to Sandakan after that and had lunch at the Ocean King Seafood restaurant, despite it being touted as a tourist trap – it was actually pretty good and the food was in as part of the tour so it can’t be that expensive. Then it was time for the city tour! 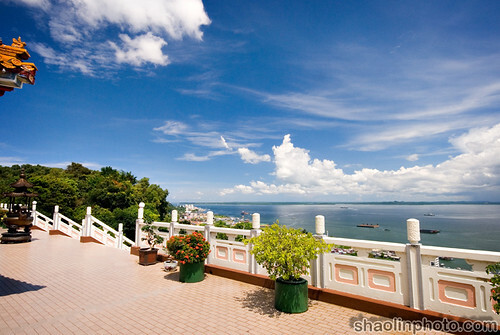 We were blessed with fantastic weather generally whilst in Sabah, but the blue skies when we visited the hilltop Puu Jih Shih Temple were just stunning. Amazing expanses of fluffy white clouds and perfect blue skies (enhanced by a CPL of course) were surrounding us 360 degrees, with the lush greenery below it made for perfect landscape material. The only downside? It was SCORCHING hot. I tried to take a panorama, but I don’t think I took enough frames so it didn’t really work out so well. Anyway here’s another one! My favourite of all? Absolutely has to be this shot, it just works for me. Oh yah, not forgetting I was actually at a temple – this is what it looks like. 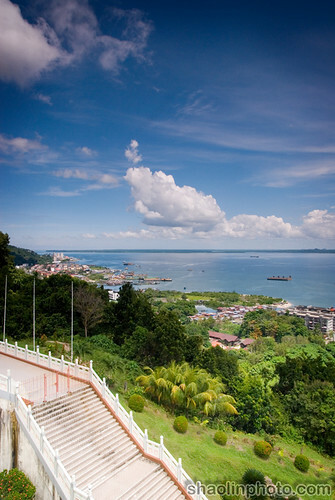 It’s a great place to visit, if you’re doing a city tour of Sandakan it musn’t be missed! The rest of the city tour coming soon! Very nice clouds, has that curvy look to them. 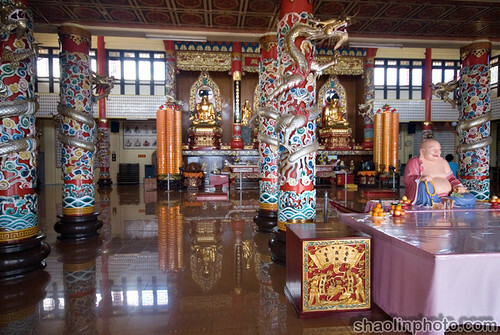 I didn’t know Sandakan had that many temples. I’ve always thought that Sabah in general has a different Chinese culture (more Christians amongst the Chinese). Interesting. Love the clear blue skies! I learned from a tip that if you want to shoot a panaromic image, you should shoot it in portrait mode. Need to take more pictures though but you got more working room to play with. love the combination of skies n the ocean. Interesting, even I myself have not been there hahaha. 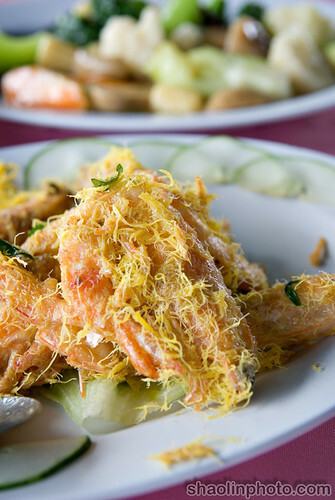 Try the seafood by the seaside and order the steamed prawn with eggs. 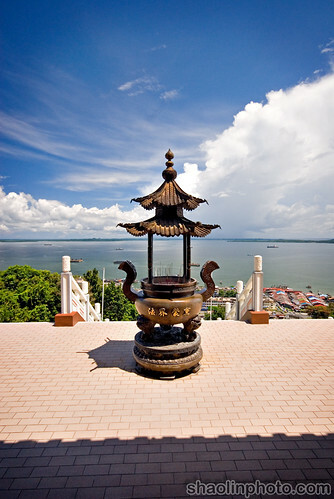 Sandakan special. James: Yah thankfully we had stunning weather, was bloody hot tho! Huai Bin: Yah we visited a church after that, they have a good mix. KY: Tasted damn good too! Mark Leo: Yah I always shoot Panorama in portrait orientation, gives you more to work with. I didn’t take enough shots though, I’m starting to think 9 or more is a good number. suanie: Yah it’s worth it for the view, the temple itself isn’t anything special.